Proud coach Slava Koulikov saluted his Phantoms players for producing their best performance in their biggest game of the season. The city side put in an heroic shift to sink Milton Keynes 2-1 in the opening leg of the English Premier League Cup final last Sunday and earn two points. 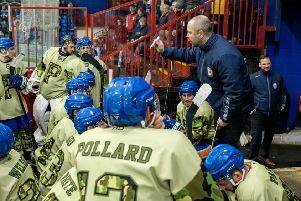 But Koulikov insists his men will have to dig even deeper to finish the job on enemy ice when travelling to Milton Keynes for the second leg this Saturday, 7pm. Koulikov said: “The guys well and truly deserved the result. “We had guys putting their bodies on the line from start to finish and I must give huge credit to every single player. “There were some big saves from our netminder, some really smart work from the ‘D’ guys and some great play from the forwards. “We have produced some amazing performances last year and the year before, but last Sunday was certainly the biggest of this season. “I can’t thank the supporters enough either. It was brilliant to see the building so full. “They created a great atmosphere and I hope we gave them something to cheer about. “But we have to remember we are only halfway through the job at most. “We switched off from hockey for a couple of days to recharge our batteries physically and mentally - now we’re ready to go into the battle again. “We have to play to the same level as a minimum in the second leg, if not more. “MK now know what to expect and I’m sure they will try to raise their game. Phantoms have already triumphed three times in Milton Keynes this season, but Koulikov admits past form will ‘count for nothing’ now. n Phantoms complete their English Premier League regular-season fixtures with a home clash against Guildford on Sunday, 5.30pm. They still sit third in the standings, but could be leapfrogged by Basingstoke, who are a point adrift with a game in hand.